Although our SportsEddy youth football camp season for summer 2012 has come to an end, the world of sports marches on. We've been avidly enjoying the London Olympics, and particularly admiring the spirit of the amazing athletes on the US Olympic team. Whether they win or lose, get silver or gold, when interviewed they are always gracious, grateful, and honest about their feelings -- even if that feeling is major disappointment. Of course, attitude is as important as training when it comes to becoming an elite athlete. It is one of the life lessons stressed at every SportsEddy football camp. The right attitude, along with the right training, can take you from your high school football team straight into the college of your choice, or perhaps even the NFL. No, it can't make you into a great player if you don't have the talent, but it can make up for a lot! After all, if you give up, doubt yourself, or let setbacks define your experience in your favorite sport -- you will never be able to go as far as if your attitude is olympian! "I wasn't in Berlin to compete against any one athlete. The purpose of the Olympics, anyway, was to do your best. As I'd learned long ago from Charles Riley, the only victory that counts is the one over yourself." "It is the inspiration of the Olympic Games that drives people not only to compete but to improve, and to bring lasting spiritual and moral benefits to the athlete and inspiration to those lucky enough to witness the athletic dedication." Are you inspired by the London Olympics? 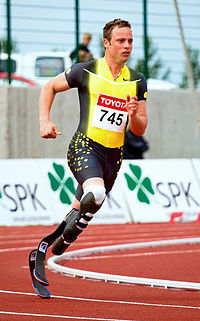 How about Oscar Pistorius, aka the Blade Runner? That guy is simply inspiration in motion. Born without fibulas, both legs were amputated below the knee before he was one year old. Pistorius became the first double leg amputee ever to participate in the Olympics (for South Africa) when he entered the men's 400 metres race on August 4th. It required a special ruling by the International Olympic Committee to allow him to compete. “People ask why I want to run in the Olympics, what am I trying to prove. Well, I just want to prove to myself that I am the best I can be." How's your attitude towards your football training, your coaches, your chances, your teammates? Do you need an attitude adjustment?